Pineapple Guava is a shrub I saw used commercially for the first time many years ago and coveted until I finally found the name and where to locate it. 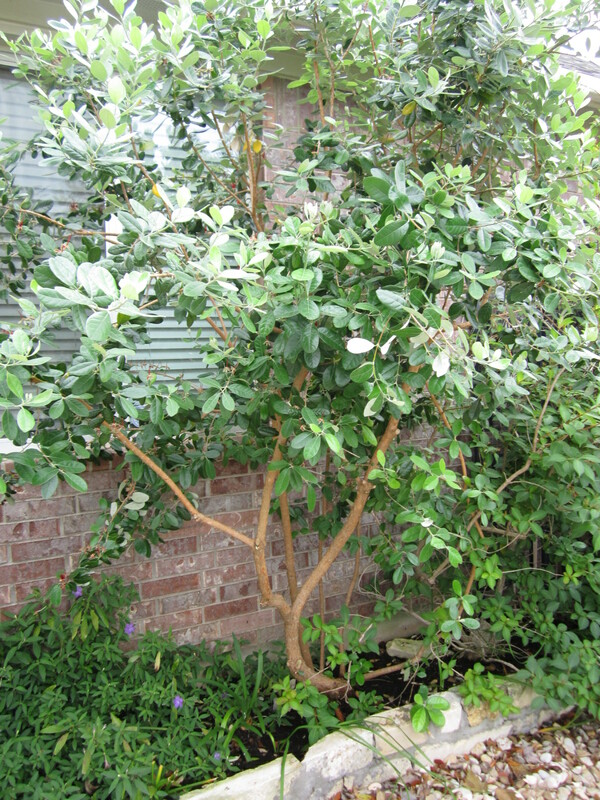 This is one of the many plants that are adapted to our area, originally from Brazil and South America this shrub seems to have made a name for itself as well as a nice home here in Austin Texas. Pineapple Guava is a beautiful full to part sun, evergreen, drought tolerant, Sage Green shrub (silver on the back of the leaves) with sparsely covered woody stems throughout. I love the openness of this shrub as it does not have that over dense quality that many traditional shrubs have. It is not really fond of being groomed as a hedge and it is almost like it is trying to tell you to let it be and enjoy the glory as it was intended. I feel the same way about Chinese Fringe Flowers, let them be, some plants are not intended for conformity, just like some people 😉 The average size of this shrub at maturity is 8′ x 6′. As with all flowering shrubs, be sure you are trimming over the Summer time and not in the Fall as any branches you cut back over the Winter will result in the loss of flowers on those branches. If you are very fortunate you may even get some delightful fruit from this shrub. The fruit is small, egg shaped and Green. You know it is ripe when the 4 lobes on the inside are clear and gelatinous. You cut open the fruit and scoop out the inside which has a fragrant, lightly sweet taste with a somewhat evergreen after taste. I have had two for 6 years and never got a single one, but my neighbor down the road gets several. I prefer to use the insides of the fruit in a smoothie as I find the taste to be a little piney. However, the nutritional benefits of this fruit are outstanding. Pineapple Guava is a great example of a huge bush that looks awesome as a tree. With its beautiful bark, interesting foliage, exquisite flowers and fruit, this is a really special tree in the landscape.